Versatile system featuring a brush-off roller for uniform scattering of fibrous materials. Using either a vacuum or an auger feeding device, the fiber material is conveyed to the scatter coater hopper. In the hopper, the fiber is evenly distributed across the width and kept at a constant level during the scattering process. For bulk materials that tend to bridge due to their flow properties, a specially designed agitator is installed above the metering roller (scattering roller) to prevent bridging. The fiber material is taken up by the scattering roller and the excess removed by a rigid doctor blade. The accurately dosed material is then conveyed by the roller to the rotary brush-off system. 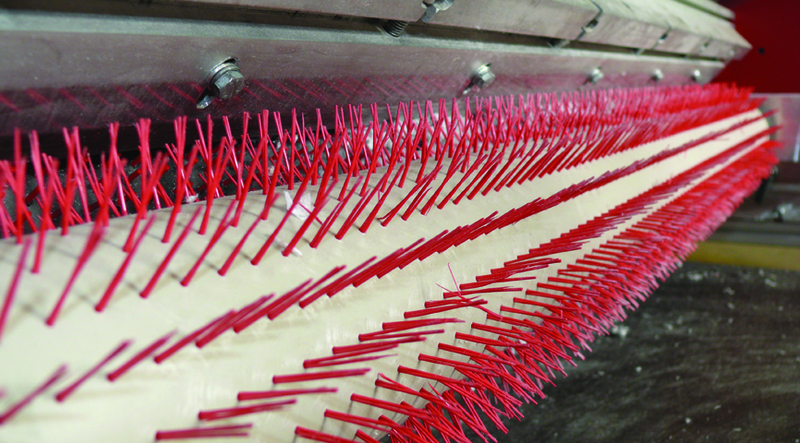 The counter rotating brush roller cleans the roller and deposits the material onto the substrate or conveyor underneath.